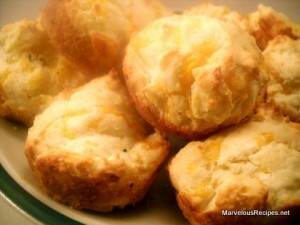 I found this wonderful recipe over at Connie’s blog Meal Planning With Connie. I made them for dinner last night and they were incredible! Light, fluffy and melt-in-your mouth delicious! 1. Preheat oven to 400 degrees F. Spray a muffin tin with cooking spray. 2. Mix all the ingredients together in a large bowl. Spoon into muffin cups filling them 2/3 full. 3. Bake for about 8 minutes or until golden brown. Makes about 15 muffins. These muffins look yummy! I’ll have to give them a try as I’ve got lots of Bisquick on hand from a great coupon/double coupon deal. Thanks for stopping by my blog today. I made these tonight and added chopped ham. They taste delicious and I’m going to put them in the fridge to microwave in the morning so my boys can have a hot breakfast on the way to school. Thanks for the recipe! It baked up just perfectly, although they could stand another 30-60 seconds in the oven to brown up a touch on top.